On October 11 the five Commissioners of the California Public Utilities Commission (CPUC)—in a move that directly undermines Community Choice energy programs in California—unanimously approved a dramatic increase in the on-going departing load charge (the PCIA) levied on Community Choice customers. Before a full house of speakers opposed to the measure (except for a couple representatives of a utility front group), the Commissioners not only rejected the results of a year-long CPUC proceeding, but also rejected a storm of protest that led up to their decision. The protest included a letter signed by over 120 elected officials and over five hundred letters of protest written to the Commissioners and California legislators. The Commissioners’ action constituted a direct attack on Community Choice—and the community benefits and community governance model that it represents. As such, it violates AB 117 (2002), by which the Legislature created the Community Choice option for local governments. Under that law, the CPUC has a duty to ensure that unfair, anti-competitive costs are not shifted to Community Choice programs, undermining their financial viability. In a display of Orwellian double-talk, the Commissioners all cited “fairness” in their new formula for calculating the PCIA, which amounts to putting a knife in the back of Community Choice programs and the customers they serve. The PCIA--in theory anyway--was meant to ensure that neither Community Choice customers nor monopoly utility customers are harmed, especially as the latter depart to superior Community Choice energy programs, now about twenty in number. The PCIA is supposed to ensure that neither group gets gouged. Yet the commissioners orchestrated a conscious attack against Community Choice customers on behalf of the state's monopoly utilities, yet another in a long list of decisions meant to put the brakes on Community Choice energy programs. 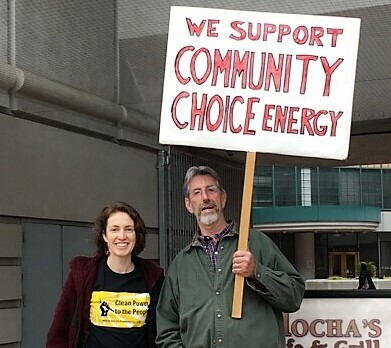 The impact of this decision on East Bay Community Energy, Alameda County’s Community Choice energy program, is yet to be determined. The California Alliance for Community Energy, the statewide organization initiated by the Local Clean Energy Alliance, which organized statewide opposition to the CPUC’s decision, is planning to respond to this latest action on a number of fronts.